With nearly 80 certified and registered projects in 19 U.S. states and five countries, in structures ranging from airports to office buildings, Parksmart is a proven, integrated standard with which to build new and improve existing parking structures. Parksmart is now on Arc. Parksmart is now fully housed on Arc, GBCI’s state-of-the-art platform that unites all rating systems, standards, protocols and guidelines across all sectors in a single platform. Arc is designed to lift all of these systems up and further USGBC’s and GBCI’s missions of transforming the way buildings and communities are designed, built and operated to improve overall quality of life. Connecting all of these systems enables users to do more—they can leverage the sustainability efforts that they’ve already pursued to more easily adopt and implement other green building standards and best practices. On a single platform, users are all connected to one another and can leverage accomplishments to learn what works and what doesn’t. Plus, with all of the data for a project in one place, we can hold projects accountable for their performance. Parksmart is one of the early rating systems that we’ve integrated into the Arc platform, and it is now fully supported through Arc. Project leaders can register their Parksmart project in Arc, complete their Parksmart application in Arc, and have all application tools available to them within the platform. We’re continuing to design more functionality for Parksmart within Arc that will give users pertinent insights into what other parking asset owners are doing, share strategies about what has worked in other garages and recommend new strategies based on what you’ve already implemented in your asset. Additional details are available in the Guide to Parksmart Certification 2.0. Email us if you have any questions or would like access to a Parksmart demo site in Arc. We’ve enhanced Parksmart’s usability as a tool for improving a parking asset’s performance over time, as well for portfolio-wide assessments. Now, Parksmart-registered structures have up to five years to work toward certification, and you may submit measures in groups over time. Historically, on average, certified garages have achieved 33 of the available 48 Parksmart measures. A garage may immediately meet the requirements for five or six measures—for example, with recycling programs, green cleaning and access to mass transit—but still need time to implement lighting and ventilation improvements or a car-share program. Projects may now work out a plan with their GBCI reviewer to document progress toward certification over time, such as by achieving 12 measures in year one, eight in year two, and the final measures in years three and four. In addition, as a portfolio assessment tool, you can have a group of parking structures evaluated, submit the measures that they can immediately achieve, plan for future improvements and benchmark the structures against the rest of the portfolio. Email us for more information and to talk about portfolio pricing. Parksmart and LEED go together. We have learned, from our experiences with the first garages to achieve certification, that LEED-certified projects often include a garage. 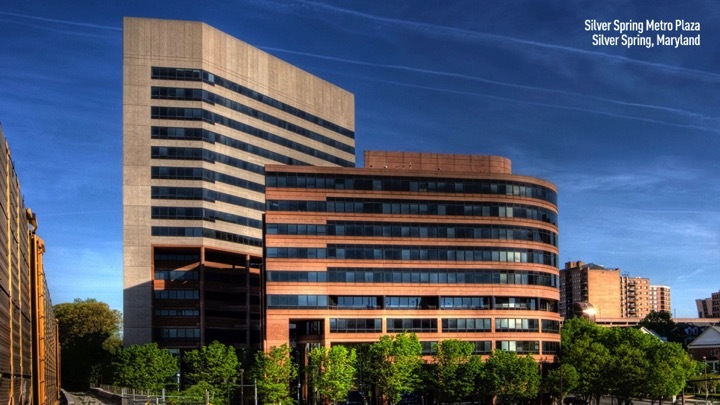 For example, the 466-space Silver Spring Metro Plaza garage sits below 700,000 square feet of office space and ground floor retail. This property achieved LEED certification, and the building owner, Brookfield Properties, was interested in expanding its sustainability program to include the parking operation. Deploying garage recycling and responsible cleaning practices. Promoting access to the nearby Silver Spring Metro Station. Providing car-share vehicles, EV fueling and bike-sharing to garage patrons. 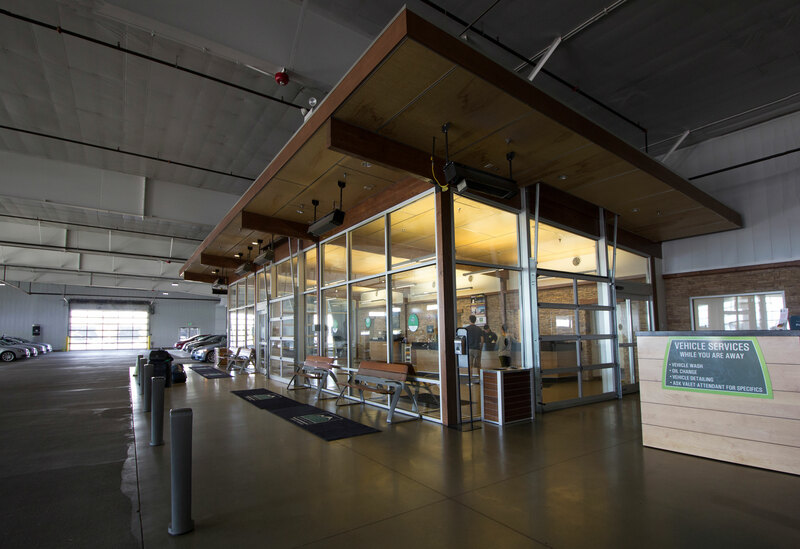 Canopy Airport Parking is an award-winning garage in Denver, Colorado, that has achieved both Parksmart Pioneer and LEED Gold certification. Recycled construction materials, commissioning, energy-efficient fixtures and responsible construction waste management were among the strategies employed at this near-airport location. Canopy is 80 percent more efficient than a comparable traditional parking structure, according to the company, and is powered by solar and wind farms. Since completing construction in 2010, the facility has built upon its green foundation to embrace sustainable operations and programming strategies outlined in the Parksmart Standard. To streamline the submission process for structures seeking both LEED and Parksmart certification, we recently released the Parksmart and LEED Synergies guidance. This guidance applies to LEED v4 and LEED 2009 B+C and O+M projects that have a parking structure included within their project boundary. The Parksmart/LEED Synergies document allows Parksmart projects to take advantage of overlap between the two programs and earn Parksmart recognition for LEED credit achievement. The three columns in this example from the guidance document show 1) the LEED credit and any specific requirements within the credit that must be met to be used as a Parksmart synergy; 2) the Parksmart measure it fulfills; and 3) any additional requirements the Parksmart project must comply with to use the synergy. 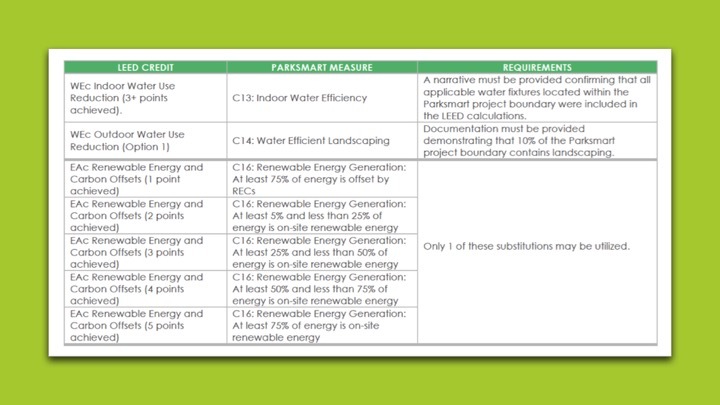 So, as an example, in the first row we can see that if a Parksmart project has achieved three or more points under the LEED WEc Indoor Water Use Reduction credit, it will be automatically awarded Parksmart Measure C13: Indoor Water Efficiency, provided that a narrative is supplied confirming that all water fixtures located within the Parksmart project boundary were included in the LEED calculations. The Parksmart and LEED Synergies guidance document and other Parksmart tools are available on the resources page of the Parksmart website. 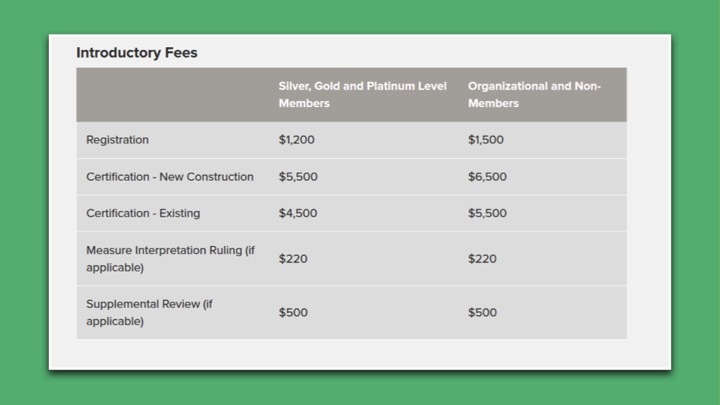 Finally, we have adjusted Parksmart’s fees to allow for discounts for USGBC members (Silver and above), a rebalancing of fees between registration and certification and reduced pricing for existing parking structures of USGBC members. See the full details. To better support architects and engineers working on new parking structure construction, look for details on a precertification process for Parksmart in the first quarter of 2018. Precertification will allow project teams to review work already completed and confirm that they are on the correct path. Arc recognizes that performance is the future of green buildings, and that the interconnections between sustainability, mobility, technology and data drive performance. Although the prescriptive current requirements of the Parksmart Certification Standard remain unchanged, Parksmart’s migration to Arc will enable us to collect data and grow our performance-based approaches. Is the use of Arc mandatory, or can applications still be submitted offline? Will Arc impact projects currently in the certification process? We believe the Arc submission process is more streamlined and user-friendly, but currently registered projects may choose the original Dropbox process or Arc. Projects registered after December 1, 2017, must use Arc. Are certifications still good for three years, and have decisions about recertification and costs been made? We expect both to be resolved by the end of the second quarter of 2018. The transition to the Arc platform will make the recertification process more streamlined. Is a fee structure available for precertification and performance approaches? Precertification will require an additional review cycle, so there will be an additional fee, which will be announced when the feature is announced. In the initial stages of Parksmart data collection on Arc, we don’t anticipate any additional fees. Will there be a free Parksmart document, similar to the LEED Rating System documents? We are currently working on one, which we expect to release by mid-2018. Will certification fees be different if projects submit measures over time, rather than all at once? Not initially. To keep the process administratively simple, the certification fee will be payable in full once a project starts submitting measures. Projects will work out a submission plan with the GBCI reviewer and will have up to five years from the date of registration to submit. Is there a list of measures eligible for precertification? Can we “bank” points along the way with precertification? All measures are open to precertification. Precertification does not award points, but marks them as anticipated, based on your approach and strategies. Measures can be awarded early on (and “banked”) under the new “working toward certification” submission approach. Do any of these change the program, as defined by the Parksmart Certification Standard? No. The Parksmart Certification is still the controlling document. The shift to the Arc platform is does not change the content of the program, but merely the manner in which you submit documentation.